The Gnu Billy Goat has gone from being a semi-loose ride for a wide variety of ability levels and returned to it’s aggressive all mountain past mainly for advanced to expert riders. It’s not the C2 BTX board it once was. Since 2014 its been C3 BTX and it’s much more of an aggressive ride. Other than a few minor tweaks, not much has changed from 2014 to 2019 Gnu Billy Goat. C3 BTX is a unique camber profile compared to the other camber and hybrid camber boards out there. I’d call it hybrid camber but it rides more like camber than anything else. There is a rocker between the feet but when there is no weight on the board it doesn’t touch the ground. The camber in the tip and tail does though so it’s like they reversed their C2 BTX so “camber dominant” is the best way to describe C3. It’s a nice improvement on the old camber model but it offers up a more specific ride for more advanced to expert all mountain to freeride riders that prefer camber. Conditions: hard at the top and good at the bottom and practically perfect with some soft off piste snow. Set Up: 23″ wide 15 front -6 back set back. Powder: This is going to have more of a camber feel in powder than the C2. It’s better than the old camber but not as easy as the effortless float you would get with the C2. Still, there is a setback and the Billy Goat has always done well in powder. People who like camber will love this ride here but people who prefer boards with rocker will not. Turn Initiation and Carving: The turn initiation is not going to have that simple feel but the board is still very quick edge to edge if you know what you are doing. Just like it’s name it handles tight steep spots very well. Carving: There is nothing like camber for carving. There is a huge improvement over the older C2 model here. You can really lay into a turn and you get that spring out of it that you didn’t with C2. You can carve off the back foot, keep it centered or drive hard off the front foot and all way’s work well without it washing out. Turning Experience: Super quick fun springy board to turn and it’s a pleasure to make turns on all day on. Speed: Bomber fast. The 2014 Gnu Billy Goat C3 BTX is a big improvement over the 2013 and below C2 because it’s more stable and has virtually no chatter. The base is pretty good and does really well when waxed but the real story is the camber just makes the board feel so good at high speeds. Uneven Terrain: Really does well for a board of this flex when dealing with bad conditions you might see on the way to a pow stash or at the end of a crowded day on the mountain. It’s got a great layer between the snow and your body and that is why it’s pretty heavy. Edge Hold: The Gnu Billy Goat C3 BTX grabs an edge about as well as the older C2 models and offers a good grip. It doesn’t grab too much when you are in soft snow like some magnetraction boards and it’s not very visible when looking at it from a few feet away like it is with some boards. This isn’t ideal as an icy condition specialist but it can handle the occasional icy patch or icy day no problem. Flex: Pretty stiff at first but then it softens up over time. Switch: It’s not ideal but it’s ok to center up for switch riding. It just takes a little getting used to compared to a true twin. 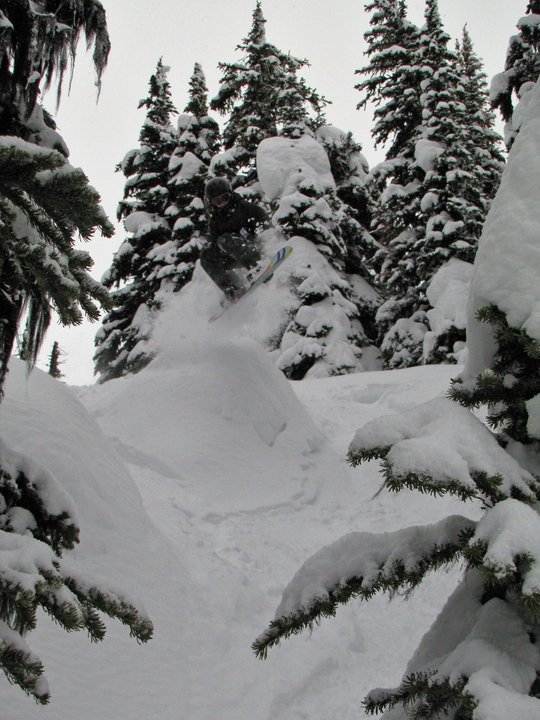 Jibbing: This is one of the last Gnu boards we would like to be on in the Jib park. Pipe: The C3 Billy Goat is the same great ride in the pipe but at the same time it’s different. It has more drive wall to wall but it’s not as forgiving and requires a more technical rider. Jumps: Like the pipe, it’s less forgiving but has a nice pop and will make advanced to expert riders very happy. All in all, this is a nice upgrade for the Advanced to expert rider. One of the things that made this a favorite in the past was it’s ability to allow a rider of any level get on it and have fun. Also, it had an amazingly easy float in powder. The new C3 is going to make better snowboarders much happier on the whole for every day riding but it’s just not going to have that same appeal to a wide range of riders that the old Billy Goat with C2 did or give you that easy float in powder. Does it make it a bad board? Hell no! This is an amazing board but it’s just going to be amazing for a smaller group of riders. Yes that works Pete and thanks for your time! The Gnu Billy Goat has been around for a while but doesn’t get the press that some of the other Mervin Boards do. It is marketed as more of a freeride/back country board but to us it’s a great all mountain board. What we really like about the Billy Goad is it’s dual personality. It can accommodate an aggressive bomber or an intermediate looking to hone his all mountain skills in any condition. Conditions: Everything from deep powder to ice and everythign in between. Riders: Eli (owns it) Peter, James, Jimbo and Mary Eli owns this board. Set Up- 23 inches Wide, Set Back 18 front -3 back. 22.5″ Wide Set Back 18 front -9 back. 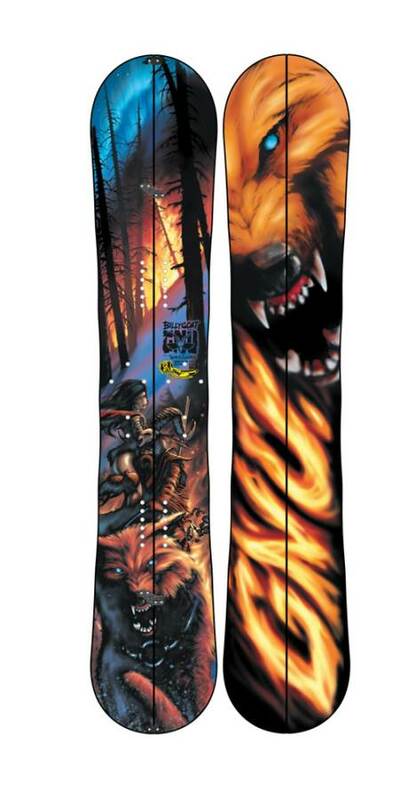 21″ Wide Set Back 18 Front 6 back. 23″ wide centered 12 front -12 back. The Gnu Temple Cummins Billy Goat C2 BTX is pretty interesting and pretty fun. To Temple and Gnu it’s a freeride board but to the average riders at The Good Ride it’s a board that is more of a ride that works most places on the other side of the park fence and some places in side it. It doesn’t have that stiff or aggressive feel so it makes for a great ride for more novice freeride to all/mostly mountain riders. It also let’s an advanced to expert rider be more aggressive with less consequence. Years ago Gnu added BTX and the 2010 Gnu Billy Goat evolved to C2 BTX. The C2 BTX shape is rocker in the center and then is bent back towards the tip and tail so it’s has rocker and camber. We call this hybrid rocker because it has rocker in the middle. This gives you a little more stability on jumps, turns, ollies ect. The 2011 Gnu Billy Goat hasn’t changed much from 2010 except the C2 BTX has been slightly refined to make the ride a litte better when the snow is hard. The 2012 The Billy Goat added new sizes and continued to refine the C2 BTX shape to make it even better in harder conditions than the 2011. 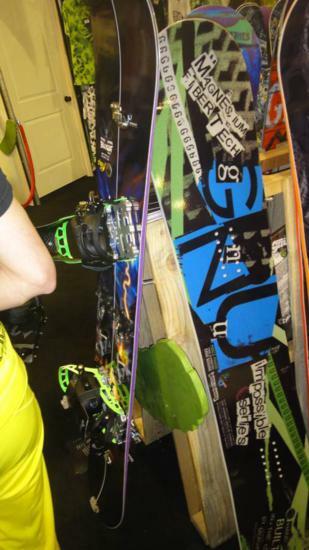 In addition to more sizes Gnu also made a split board for backcountry riders. The 2013 Gnu Billy Goat– Aside from a few minor refinements the 2013 is very similar to the 2012. So basically it changed drastically in 2010 but then hasn’t changed much since. On Snow Feel: Like many hybrid rocker boards it feels a little loose and unstable between the feet on harder snow but in softer snow to powder feels stable. This board really improved over the last few years and now does a lot better when one footing or flat basing on groomers. Although it improved tremendously from last year it still isn’t there with some of the flat to rocker or hybrid camber boards out there. Powder: This is borderline excellent and we cant really argue with someone who wants to call it Excellent. 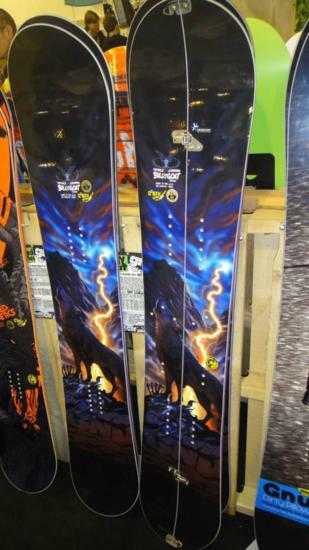 The YES The Optimistic and the Temple Cummins are probably two of our favorite Twin/Twinlike powder boards out there. The old Camber Temple Cummins did very well in pow but the C2 BTX is a whole new level in double ender pow riding. It can make a board that should be ok in powder almost ride like a powder board. We had a day with about 1 to 2 feet of powder and then we found our way into some deeper powder from some wind loading and this board kept it’s nose up even though we didn’t lean back. It’s like adding 3-6 CM to the board but you still have that smaller board maneuverability and feel. This board is stiff and fast so it carried it’s speed well through the flats on your way back to the chair. 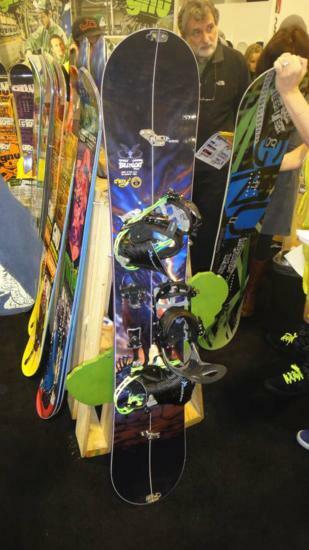 If you want one board to do anything but still perform exceptionally well in powder then this might be your board. We haven’t experienced many other boards with a similar shape that can ride like this in powder. It changes the way you think about riding when it dumps and could almost be a powder specific board killer. Turn Initiation and Carving: Probably the most important part of a board. Even though this board is pretty stiff it can turn like a intermediate/beginner board. When we first ride a board we take as many quick turns as possible. This board turned as fast as we could lean and took almost no effort to get this thing to respond. One of the riders at the Good Ride said if it turned any easier he wouldn’t like it. He felt that he still liked the cambered board for initiating a turn. Another rider (me the editor) loved this board and felt it was a pleasant surprise to have a board respond so quickly and still ride so fast. Usually you sacrifice speed for turnability. If you haven’t tried C2 BTX it’s definitely different than a traditional cambered board and a reverse cambered board. It’s still a tough call on a groomer day though. It does turn well and hold an edge it just doesn’t have the stability of a cambered board on hard pack at high speeds. It does a great job for a rocker board though. When it comes to carving the Billy Goat does a pretty good job. You can lean into it pretty hard and the tail doesn’t wash out but it doesn’t have that super fun feeling that camber and some hybrid camber boards have. Speed: C2 BTX has helped eliminate some of that that sketchy feel at high speeds but it’s still a little loose/squirrely. For a board of these designs and shape it still does a good job and is better than most C2 BTX boards out there. Uneven Terrain: So in uneven terrain like hard or soft bumps on the way to powder are handled very well for a board of this flex. It’s great in getting through chunder but it’s also great dealing with tracked up end of the day groomers as well. Approximate Weight– Its well built and damp so don’t expect it to be a feather. You can expect to have this board last for several years. Edge Hold: Even though this board has a mellow MTX cut (almost un-noticeable from some angles) it’s stiffness really makes the Billy Goat hold an edge in just about anything you will want to ride on. This will hold well on hard pack and hold very well in ice….if you have to ride on it. Flex: Pretty Damn Stiff! 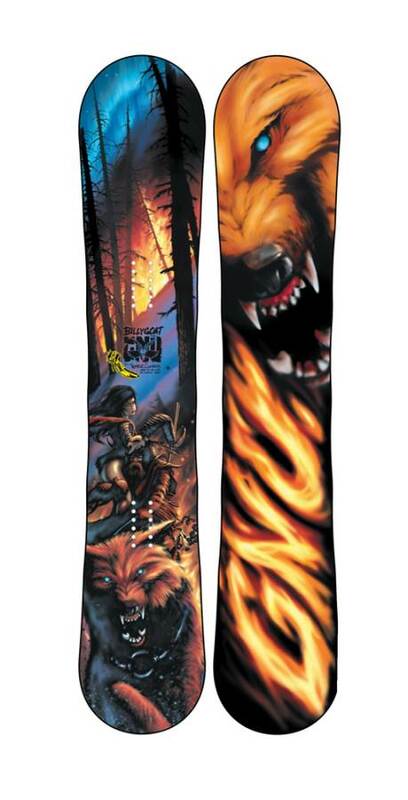 This and the phoenix we feel are mervins stiffest/fastest boards. these boards both are made to hold an edge and eliminate chatter at almost any speed. There are other companies that have stiffer boards but these are up there. The weird thing about the Gnu Billy Goat is that when riding it doesn’t feel incredibly stiff for an all mountain/freeride board. Jibbing– Not really designed for jibbing but it will be OK if you want to hit the jibs in the park. Having the tip and tail slightly up made the board less catchy when screwing around. Switch: The front nose is much taller and it’s very hard to center your board so you would think that riding switch on this somewhat twinish directional board would not be that easy. That being said you can ride switch surprisingly well on the Billy Goat. We think C2 BTX has more emphasis on turning with the center part of the board and the tips turned up. It’s not going to be like the riders choice but it will be fine to give your calves a rest traversing to the spot you want to drop in and for those stops in the park. Rails and Jibbing– uhhhhhh we didn’t want to ruin this pretty board so we will guess that its ok but there are much better boards for rails and jibs. Pipe: Pretty damn fun. medium/stiff directional boards usually do pretty well in the pipe. This can climb a pipe wall very well and is pretty forgiving coming back down for a board so stiff. Jumps: For natural jumps this board is excellent. It’s also very easy to generate your own air and lives on the poppy side of life. We try to get as many images of the Gnu Billy Goat, but forgive us if they're not all there.